This monster appears in the artwork of Cybernetic Overflow. 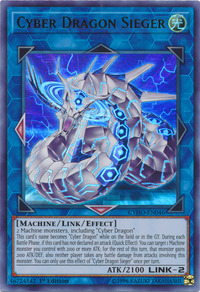 This monster is probably the upgraded form of Cyber Dragon Herz, evolving in the artwork of Cyber Revsystem. Sieger in this monster's name is German for winner or victor.